Daniela Dessì was the great protagonist of the opening of the 61st Puccini Festival in Torre del Lago. She received standing ovations at her appearing on the stage and after “Vissi d’arte”. The new production of Tosca, directed by Giorgio Ferrara with the set design realized by the artist Mimmo Paladino, was conducted by M° Valerio Galli. Aquiles Machado and Mirko Matarazzo performed the role of Cavaradossi, and Alberto Mastromarino the role of Scarpia. “The performance started immediately on a high note, with Daniela Dessì welcomed by a clapping audience like in the old times. Since the first duet with the tenor, her voice appeared wide, penetrating (especially in the higher octave), and with a rich timbre. Her figure stood out for her nobility and beauty, and her style and her flawless knowledge of this role emerged. Daniela Dessì dominated the tessitura – from the most insidious lyrical passages (“Le voci delle cose”) to the most dramatic moments, included all C di forza in the second act. She also interpreted a well-drawn character, stressing vividly every single phrase, and receiving various standing ovations. […] After “Vissi d’arte” the audience in rapture asked persistently an encore that she kindly granted. “Daniela Dessì, one of the most brilliant artists of the Italian opera scene, interpreted the role that most strongly marked the second half of her long career. […] She was in a state of grace and she embodied a nearly perfect Floria Tosca, especially from point of view of the interpretation. First of all, we must point out her excellent technique, that belongs to the Italian tradition. Thanks to this, her voice floated in the air with a warm and soft central register that is so important for this role: the melodic sinuosity phrases such as “Finché congiunti alle celesti sfere” made visible and tangible the idea of “nuvole leggere”. My way to evaluate an interpretation of Tosca relies on how the artist deals with the first hurdle, i.e. the passage to the B flat acute in “Le voci delle cose”: Daniela Dessì solved elegantly this tricky phrase, and she even lasted softly that note. The high C of “quella lama” was very confident, long and penetrating. [...] The well-known passage “E avanti a lui tremava tutta Roma” was very natural and effective. I really appreciated her decision to sing all the phrases usually spoken or shouted (“Quanto?”, “Il prezzo!”)”. 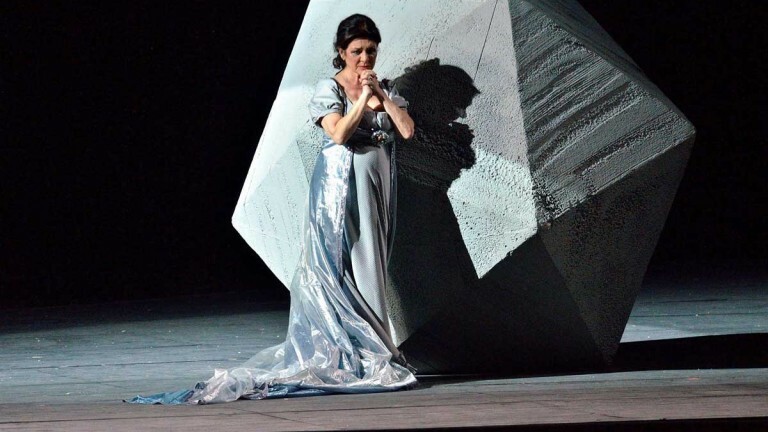 “Daniela Dessì, a veteran of this title role, gave as usual a staggering performance: once again she confirmed to be a great joy for the eyes and ears of the audience. Her stage presence is always magnificent, and she demonstrates a deep knowledge of Tosca: her acting reflects every nuance of the character, and her voice is always powerful and confident. The audience welcomed her with a standing ovation and intensely demanded the encore of her extremely touching “Vissi d’arte”, that she kindly granted right away. This has been a shining performance of this first lady of the opera, and her triumph was totally deserved”. “Tosca had an extraordinary success: the audience clapped loudly giving Daniela Dessì a long standing ovation, and she sang again “Vissi d’arte”. Even Alberto Marino, on the stage as Scarpia, clapped her splendid performance”. “Daniela Dessì was Floria Tosca; she certainly dominated the performance with her voice and interpretation. […] Her singing charmed the audience that cheered her entrance (“Mario, Mario!”). She progressively built a dramatic crescendo, since she knows every nuance of this score: she delighted the audience with her wonderful dynamics, and with her voice that was bright and confident in the high register, as well as strong and with focused intensity in the low register. Furthermore, the volume of orchestra never “won” on her voice, and fully merged”. Star Daniela Dessì saved Puccini Festival, undermined by a crisis. 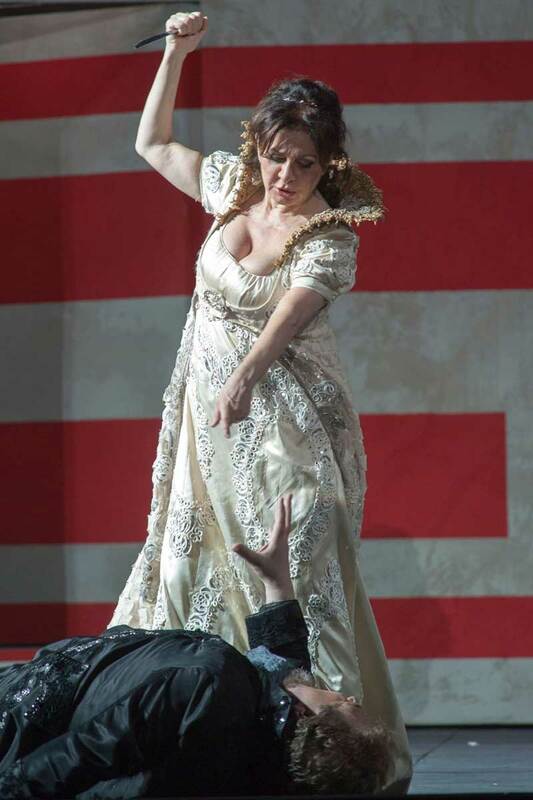 […] Daniela Dessì was Floria Tosca as announced: she is one of the best divas performing this title role over the world. Thanks to the intensity of her voice, and the plausibility of her dramatic interpretation, the Italian artist outperforms any other soprano. […] Every gesture is great, every phrase is emphasized in the right way. She embodies the heart of Verismo so deeply and clearly that she touched the audience […] It is essential to listen to her encore of “Vissi d’arte”. She did not simply sing again the aria, but she performed another interpretation that is really penetrating, with a more lyrical, full, and touching legato. This is Opera in Italy: the show, the passion, the vocal prominence, and the interaction with the audience”.